Being a Sheffield Wedding Photographer is a fantastic experience. There are some amazing venues in and around the city at which we get to practice the art of photography. The Kenwood Hall Hotel in Sheffield is one of my favourite locations for weddings and wedding photography in Sheffield. This wedding took place on the hottest day of the year in 2015, it was truly scorching, so hot intact that the dance floor remained empty for most of the evening with the guests making the most of the beautiful evening and the 14 acres of grounds at the hotel. I love reflections and try to make use of them whenever I get the opportunity. The Kenwood Hall Hotel has this fantastic lake which when the weather is calm and still and the water flat forms an almost perfect mirror. 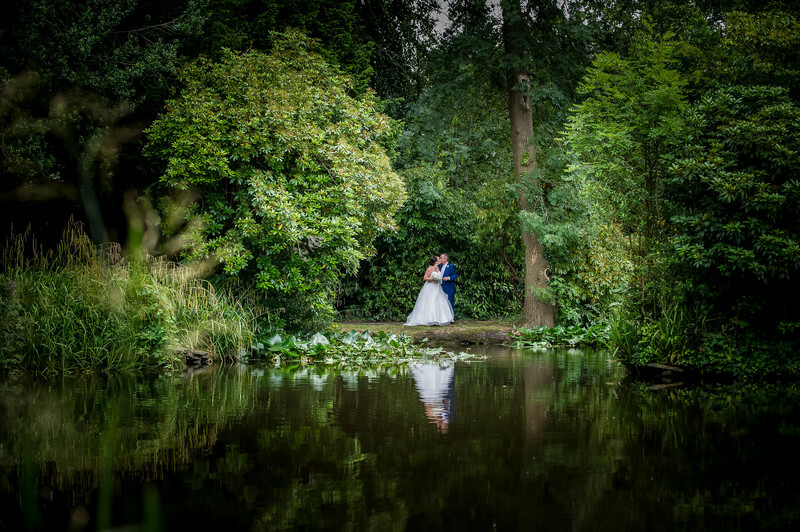 There were some very slight ripples in the water on this day but it is still very calm and tranquil and gives a pretty good reflection of our newly weds. I hope during the course of my career as I continue as a Sheffield Wedding Photographer that I come back to the Kenwood Hall time and time again, I never tire of being here, each Wedding is special for those concerned and photographing it is a pleasure and privilege for me.